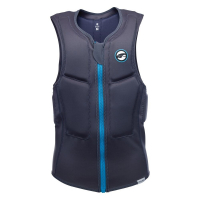 Our slider vest front zip half padded is a multisports impact vest for all watersport activities as kite and Wakeboarding. The half padded slider vest can be used with a harness, no padding were the harness is placed. Front zipper for easy entry and heavy padded panels for impact, stretch and compression. The stretch vest is a waist high padded impact vest. Designed to use in combination with a waist harness. Ideal for kiting or windsurfing. Lower section of the vest in not padded so you can wear the vest under your harness. The perfect vest if you want to learn new tricks. FLOATING VEST FREERIDE WAIST Our floating vest freeride waist is an ISO/CE-N50 approved vest. The vest is medium buoyancy padded. The freeride waist is our floating vest deluxe. Featuring a cut out on the front for easy use with harness. The Neoprene side panel and double buckle closure prevent movement of the vest. Ideal for most water sport activities as Windsurfing, Kitesurfing & Sailing.